If you manage a business of any size, you probably notice some conflict between your employees from time to time. Many managers simply accept that workplace conflict cannot be avoided, but is conflict really normal? While some conflict is probably inevitable, systemic conflict indicates that you have a problem. Just as with any other problem, avoiding conflict begins with being aware of it. Be on the lookout for signs of potential conflict, and be ready to respond appropriately. If the level of conflict in your organization has already become unmanageable, you may consider consulting with a workforce management solutions provider. If your organization has gained a reputation of being a negative or hostile work environment, it will begin to affect your recruiting efforts. Very few people enjoy an atmosphere of conflict. Some of your employees may respond by being absent more often. Continued conflict affects our mood, emotional health and, eventually, our physical health. One of the best indicators of decreased morale is an increasing rate of employee healthcare utilization. These are only a few signs of serious conflict; be on the lookout for these and other signs. To resolve conflict in your workforce, you will need to put a well thought out, intentional plan to resolve it into place. Work with your Human Resources professionals to devise a plan to address conflicts in the workplace quickly and effectively before they can spread. This is what an appropriate plan might look like. The culture of your business begins at the management level. The managers, including you, earn more money and have more responsibilities than the average worker. It is reasonable to hold them to higher standards of behavior. 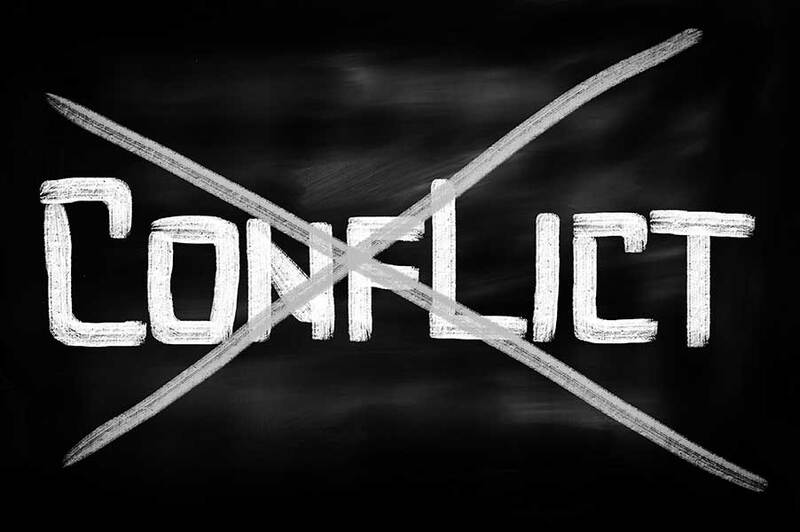 If you want to stop conflict before it can cause serious problems, you must detect it at the early stages. Your supervisors cannot catch every conflict; consider instituting an anonymous employee reporting system. When an allegation of inappropriate behavior is made, be sure to investigate the claim before taking disciplinary action. It is usually not appropriate to act on the testimony of just one coworker. Your Human Resources files should track which employees make complaints; making excessive complaints is a potentially passive-aggressive behavior. Employees who make excessive complaints may actually be driving conflict in your organization. Disciplinary measures should fit the severity of incidents. For certain particularly troublesome behaviors, a zero tolerance policy may be appropriate. For lesser offenses, an escalation of discipline is the best approach. You should avoid a “one-size-fits-all” policy that unilaterally imposes discipline. Be flexible in your approach, but avoid favoritism. A certain level of conflict in the workplace is normal, and may even be healthy. High levels of conflict that affect the smooth operation of your organization are not normal. Whether you choose to consult with a workforce management solutions provider or develop your own methods of discipline, do not leave conflict unchecked. Resolve conflict appropriately to make your workplace a better, more productive environment for everyone.